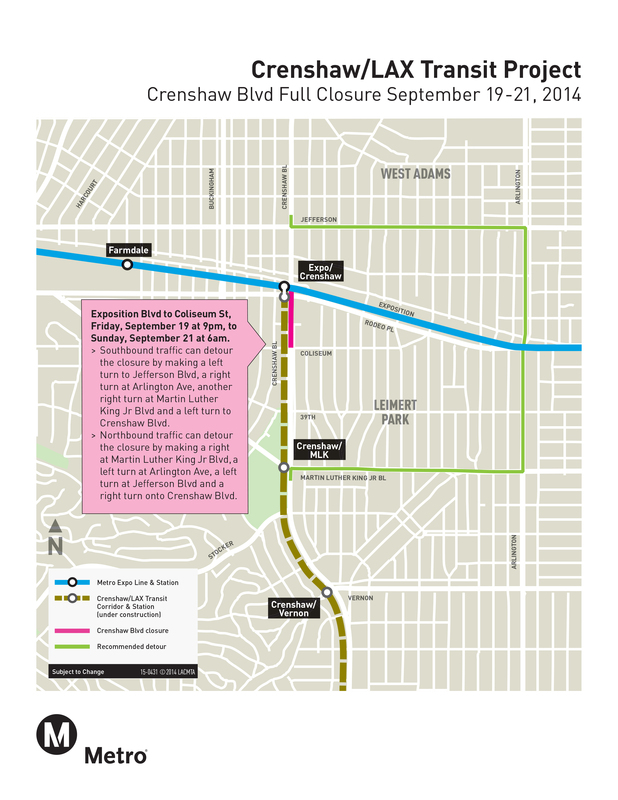 Metro and Walsh/Shea Corridor Contractors will close Crenshaw Boulevard between Exposition Boulevard and Coliseum Street two weekends on Sept. 19 and Oct. 24 to complete pile installation and begin excavation of the underground Crenshaw/Expo station. The work has been schedule for two weekends, Friday, Sept. 19 to 6 a.m. Monday, Sept, 22 and 9 p.m. Friday, Oct. 24 to 6 a.m. Monday, Oct. 27. The installation of pile and building of the walls is necessary for the construction of the light rail line Crenshaw/LAX and its underground stations. Simultaneous wall installation and soldier pile will continue to occur behind K-rail on the west side of the street. If traveling south on Crenshaw Boulevard, turn left at Jefferson Boulevard, right at Arlington Avenue, right at Martin Luther King Jr. Boulevard and left at Crenshaw Boulevard. If traveling north on Crenshaw Boulevard, turn right at Martin Luther King Jr. Boulevard, left at Arlington Avenue, left at Jefferson Boulevard and right at Crenshaw Boulevard. Eastbound and westbound traffic on Rodeo Road will be maintained as well as access to businesses and pedestrian access. Pile installation operation for the Crenshaw/LAX Transit Project underground Martin Luther King station will move on Sept. 20, from the east to the west side of Crenshaw Boulevard between Martin Luther King Jr. Boulevard and Stocker Street. A 16-hour full street closure will be needed to implement a new traffic reconfiguration it will begin at 9 p.m. Saturday, Sept. 20, and concluded by 1 p.m. Sunday, Sept 21. The detours will be done in two phases: from 9 p.m. to 2 a.m. between Jefferson Boulevard and Vernon Avenue and from 2 a.m. to 1 p.m. between Martin Luther King Jr. Boulevard and Stocker Street. If traveling south on Crenshaw Boulevard, turn left at Jefferson Boulevard, right at Arlington Avenue, right at Vernon Avenue and left on Crenshaw. If traveling north on Crenshaw Boulevard, turn right at Vernon Avenue, left at Arlington Avenue, left at Rodeo Road and right at Crenshaw Boulevard. When traveling south on Crenshaw Boulevard turn left at Martin Luther King Jr. Boulevard, right at Arlington Avenue, right at Vernon Avenue, and left at Crenshaw Boulevard. If traveling north on Crenshaw Boulevard turn right at Vernon Avenue, left at Arlington Avenue, left at Martin Luther King Jr. Boulevard and right at Crenshaw Boulevard. The traffic reconfiguration will allow street restriping, relocate existing K-rail (concrete barriers) and place heavy equipment to continue building the walls for the underground station. 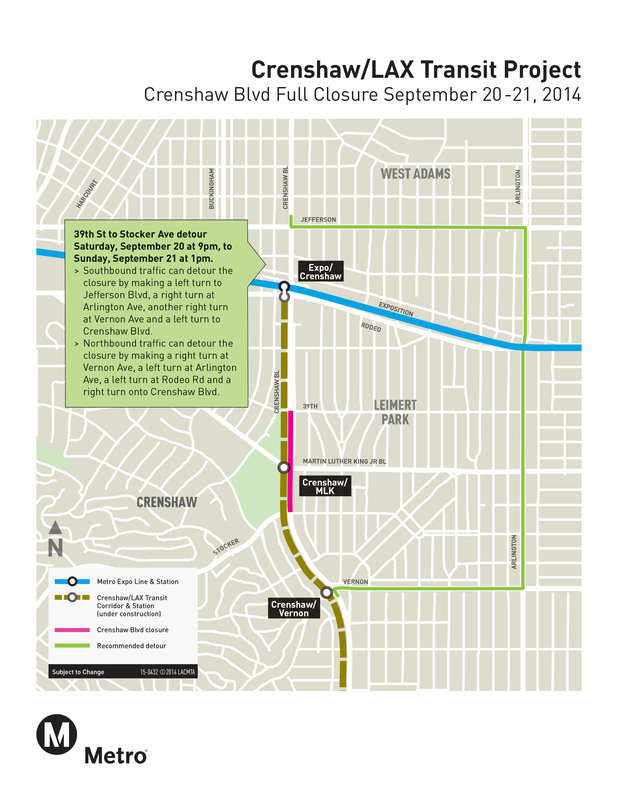 After the Sept 20-21 weekend Crenshaw Boulevard will have two traffic lanes in each direction. Once the street reopens Sunday afternoon, the left turn pockets on Martin Luther King Jr. Boulevard and Stocker Street will be restored. The same reconfiguration will last for approximately next three years until the underground station is completed. There will be limited access to businesses during the night-time activity, although pedestrian access will be maintained. Also, after the closure, bus stops on the west side of Crenshaw and on Martin Luther King Jr. Boulevard will be relocated to the northwest corner of Crenshaw Boulevard and Martin Luther King Jr. Boulevard, and to the southwest corner of Crenshaw Boulevard and Stocker Street. 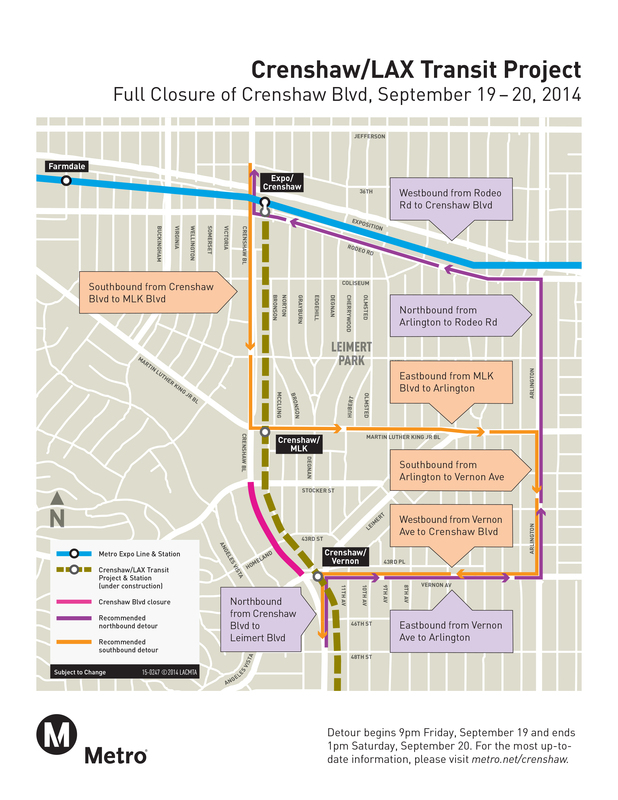 Construction of the third underground station for the Crenshaw/LAX Transit Corridor will begin the weekend of Sept. 19 with a 16-hour full street closure on Crenshaw Boulevard between Stocker Street and Vernon Avenue. The street closure will begin at 9 p.m. Friday, Sept. 19, and continue until 1 p.m. Saturday, Sept. 20. The traffic reconfiguration will allow establishment of a work zone on the west side of the boulevard so that support piles to can be installed in preparation for construction of the Crenshaw/Vernon Station box. Two traffic lanes will remain open in each direction during the four years of underground station construction. The street will be restriped and K-rail (concrete barriers) with fencing will be placed to separate the work area from the road. If traveling southbound on Crenshaw Boulevard make a left turn at Martin Luther King Jr. Boulevard, at Arlington Avenue turn south at Vernon Avenue turn, west back onto Crenshaw Blvd. If traveling northbound on Crenshaw Boulevard, merge with Leimert Park Boulevard. Then turn left on Vernon Avenue to Arlington Avenue. On Arlington Avenue turn left on Rodeo Road. Then turn west/right on Crenshaw Boulevard. Access to all business will be maintained. However, during certain stages of the work, pedestrian access may be limited. Bus routes in the area will continue to operate. However, bus stops within the immediate work area may be temporarily relocated. The 8.5-mile Crenshaw/LAX Line is a $2.058 billion light-rail line that will connect the Green Line and the Expo Line. It will have eight new stations. The Crenshaw/LAX Line is expected to open in 2019. For more information on the Crenshaw/LAX Line, go to metro.net/Crenshaw or join us on Facebook at https://www.facebook.com/CrenshawRail and on Twitter at https://twitter.com/crenshawrail. Will each of these three underground stations have mezzanines? Will their station designs be similar?